Remember when third-party controllers cost less than first-party ones? 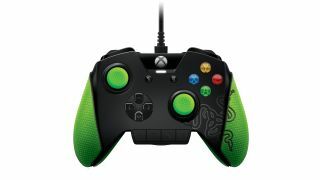 Following in Microsoft's footsteps, Razer is building a controller for the most elite Xbox One gamers. It's called the Wildcat and it will offer a slew of tweakable controls in the form of four remappable macro buttons - two next to the left and right bumpers and two on the underside of the wings. The controller, which has a release date of October of this year, will come stock with reinforced high carbon steel analog stick necks, removable high-end aluminum triggers and optional palm grips and analog stick grip caps. And while the all that metal sounds like it should theoretically add some heft, Razer claims that the Wildcat will be "25% lighter than other tournament-grade controllers." It's a similar concept to Microsoft's upcoming Elite Wireless Xbox One Controller, and even shares a similar price-point at $149.99 / €179.99. The controller will come with a detachable 3 m / 10 ft. lightweight braided fiber cable as well as a carrying case for toting the tech from tournament to tournament ... or, you know, to a friend's house. Finally, a four-button control center sits on the face of the controller that allows you to instantly mute yourself and control the volume level of your mic. From the pictures it looks like the Razer Wildcat shares some distinct similarities to the incredibly solid, award-winning Sabretooth Xbox 360 Pro Controller. The true test, however, is if the Wildcat can oust the Elite as the Xbox One's go-to tournament pad. No, the Xbox One Mini isn't a real thing.